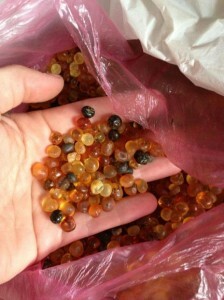 Baltic Amber Necklaces Archives « Breastfeed.Babywear.ClothDiaper.Naturally! Breastfeed.Babywear.ClothDiaper.Naturally! Teething. 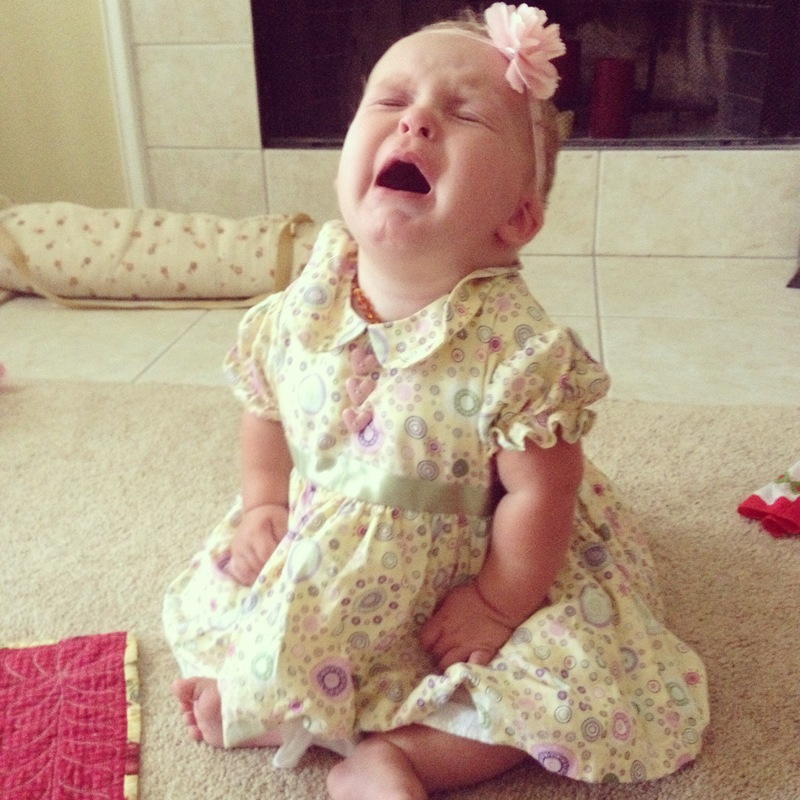 One little word, so many feels from anyone who’s parented an infant. The drool, the rashes, the fussiness. It’s a tough time for babies and for parents. There are lots of things parents do to help their little ones. My mother-in-law gave my babies frozen chunks of melon. I remember my mom giving my siblings water-filled plastic rings that she put in the freezer to chew on. My sons have all worn/are wearing amber necklaces and we experimented with teething tablets and mesh feeding bags as well. But the newest thing I’ve been seeing for teething relief in the past few years is teething jewelry. Teething jewelry is made of wood or silicone beads fashioned into a necklace or bracelet that is worn by a parent. Ta-da! Portable teethers that can’t get lost. Super smart idea! The first ones I remember seeing were a pendant worn on a string, with the silicone colored to roughly resemble natural stones. Now though, you can get just about anything in just about any color, thanks to the flexibility of silicone material and creativity of designers. Plusses to teething jewelry are, like I mentioned before, how convenient it is to be wearing a teether. Whether it’s at home or on the go, it’s really nice to have something always on hand. When you are wearing it, your baby can’t chuck it out of the carrier or stroller. You can also choose to attach it to the carrier or stroller. Also, there are a ton of fun colors and designs available. It’s possible now to wear chewable jewelry and not look like you’re wearing, well, a chew toy. The price point is pretty affordable as well, which could allow you to have a couple different options to wear each day (I almost wrote “match,” but I wasn’t sure what matches spit-up covered busted t-shirts and leggings). Downsides: Well, like anything, kids are fickle. Not every kiddo is going to like or get relief from chewing silicone teethers. It’s probably best to start with one inexpensive item and see how your child likes it before buying more. Also, I’m not personally a germaphobe, but I could see how some people may not like the potential germ-collecting possibilities of some pieces, particularly bracelets (though all teethers may make germaphobes a bit squeamish as well). The jewelry is very easy to clean with warm, soapy water, low maintenance (yay!). Ah, the joys of teething. Buckets of drool, cranky babies, and sometimes rashes or low-grade fevers to go with it. Babies can start showing signs of teething months before the first pearly white pops too, leaving you and your little one frustrated to say the least. There are lots of ways you can help your little one through the joys of teething. First, dealing with the drool: a drool bib or frequent shirt changes help your child stay comfortable and rash free on her chest. You may also see her chin develop a small rash; keeping that area as dry as possible (so hard when it’s nonstop, right?) should minimize this. Finally, the large volumes of drool can also affect your baby’s bottom. Some babies get diaper rashes during teething from swallowing all of the extra drool. Using a barrier cream like CJs and frequent changes and/or air time should curb this. Your baby will probably be extra chompy while he’s teething, too. Having some appropriate teething toys at home and in the diaper bag is a good idea. My boys both loved chomping on their Sophies, but a small assortment of teething toys is nice in the beginning to see what your baby prefers. 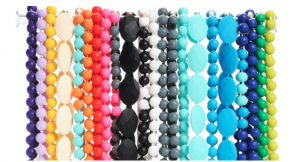 A lot of moms (and babies) love chewable jewelry. These are bracelets or necklaces for mom to wear made for babies to chew on. The beauty of these is you always have it with you and they are almost impossible for your baby to drop since you’re wearing it. My mother-in-law swears by frozen fruit for teething. She cubed up some cantaloupe during a visit once and tossed it in the freezer. My miserable little man couldn’t get enough. I think between the cold and the chewing it was teething baby paradise. You will want to directly supervise if you go this route and use large chunks (to avoid choking). You can also find little mesh bags to put the fruit in to minimize the risk even further. Finally, there are some good ways to minimize their pain during this tough time. Baltic amber or hazelwood necklaces are well loved by many moms and babies. These are worn (not chewed) and their contact with the skin can help with the pain. Heads up, our pediatrician always advised us to take our sons’ necklaces off whenever they slept. Some babies get relief from homeopathic teething tablets as well. Here at Mom’s Milk Boutique, we source only 100 percent Baltic Amber to sell in our store–we know you are counting on it! Baltic amber is effective for pain relief, strengthening your immune system, restoring natural energy, and relief of chronic inflammation. So how is it made? First, our production team personally selects the best raw materials. Each piece that we buy is checked for quality and inspected by the Ministry of Finance of the Republic of Lithuania so that we can be certified by the Ministry as selling genuine Baltic Amber. After each piece is inspected for quality and the best materials are selected, our trained workers hand-cut it into the desired shapes. Next, the darker colors are strengthened in a machine, and the amber is then sorted and separated. To clean the amber, we use a process called wet polishing, in which quartz sand is used to polish the amber and remove any dirt. The longer it says in the wet polish stage, the more round and shiny the amber becomes. Then, the amber is dry-polished with special wood or ceramic beads. 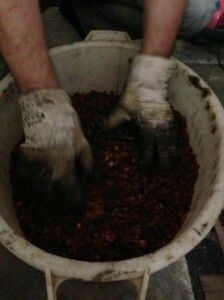 Then, all the amber is washed to remove the residues from the wet and dry polishing stages. 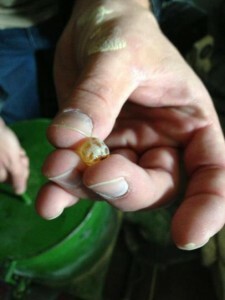 No chemicals are used, and all the amber is washed by hand. After the amber dries, it’s sorted by color: cherry, dark cherry, green/earth, lemon, honey, cognac, and milky/butter. Once the beads are sorted, our master craftsmen drill the holes in the beads. Drilling is an important step in the process, since holes must be drilled straight through the beads to make them strong and long-lasting. Finally, the beads are threaded and knotted by hand. 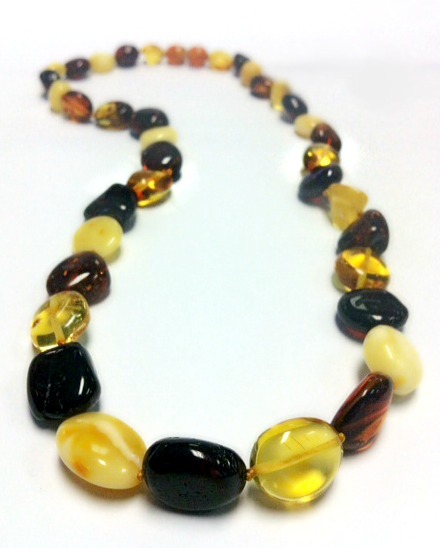 The quality of an amber necklace can be determined by the gaps between the beads and the knots. A quality necklace will have small knots and small gaps between the knot and bead. The clasp goes on last. We inspect each and every piece of amber jewelry for quality to ensure that the beads are not cracked or broken and that they are all the right shape, color and weight; that the gaps between the knots and beads are small, and that the clasps are secured the right way. Each and every necklace is unique and has a different look. There are no two necklaces the same. They beautiful necklaces are created for children and for adults. 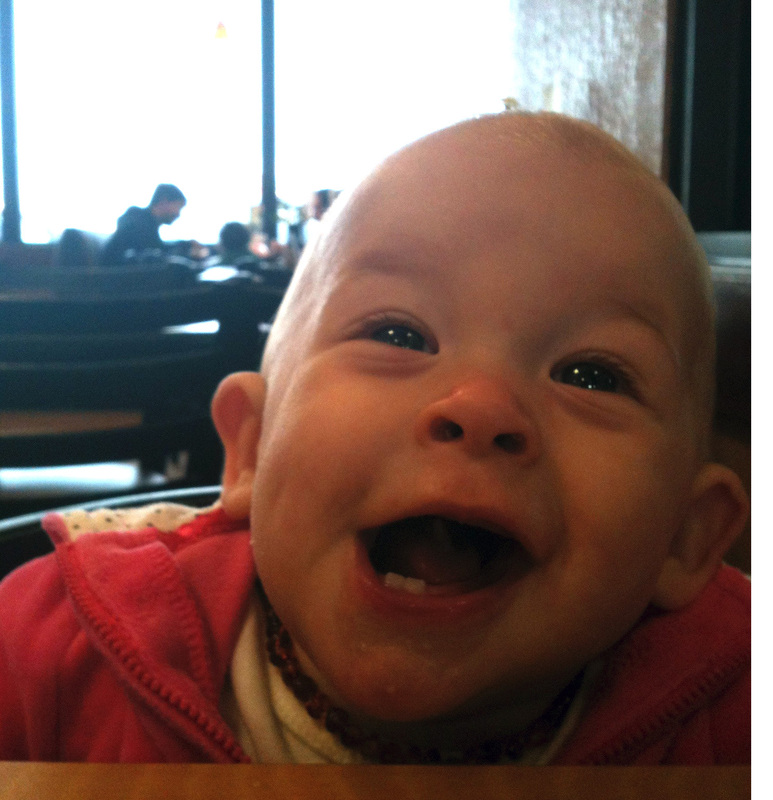 The completed necklaces are just stunning…..
Teething is an unpredictable–sometimes painful–part of being a baby. While some don’t get their first tooth until they’re almost one, some babies sprout their first teeth as early as four months and may begin to experience teething symptoms for a good month before that tooth makes an appearance. You might get lucky and have a child that shows no signs of discomfort but just wakes up with teeth–lucky you! But for most babies, there’s a period of discomfort accompanied with many teething symptoms that you may not recognize as being caused by teething. Knowing the signs will help you understand whether or not the unusual behavior is due to teething. Irritability and lack of appetite. Babies experiencing pain from teething are in pain, cranky and may not want to feed as often. The sucking motion of nursing or bottle feeding can actually make already sore gums feel worse. 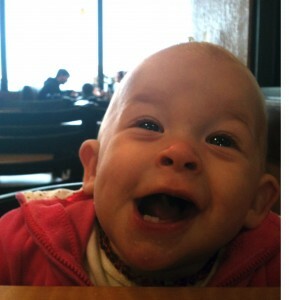 Babies eating solid food may also refuse to eat because of discomfort. Drooling. Teething stimulates drooling, so when you notice an increased amount of baby drool or constant bib wearing, chances are that teeth are starting to brew. Frequent coughing or spitting up. All that drool usually makes babies cough and even gag a little bit. Don’t be surprised if your baby wakes up in the middle of the night to spit up as well; their tummies are just trying to get rid of all the drool they’ve been swallowing. Face and Chin rash. All the moisture from the drool makes babies prone to developing red bumps, chapping or even dry skin that may even extend down to the neck. Biting. The counter-pressure of biting often helps relieve the pain of teeth beginning to poke through. If your baby is gumming everything they can find they’re very likely dealing with teething. Diarrhea. Some babies seem to have loose bowel movements while they’re teething and more frequent diaper rashes. Make sure to keep an eye on frequent diarrhea and report it to your doctor if it seems excessive. Trouble Sleeping. Unfortunately the pain and irritability of teething may drag on through the night causing them to wakeup due to discomfort. Low-grade fever. Inflamed gums sometimes produce a low-grade fever (less than 101° F). If it lasts more than a day or two check with your doctor to rule out anything else that may be causing it. Cheek rubbing and ear pulling. When gums ache you may notice your baby constantly touching their cheeks in a futile attempt to make their pain go away. Gums, ears and cheeks all share the same nerve pathways so it’s not uncommon to see them pull on their ears due to teething pain as well. Make sure to keep a close eye on all these symptoms and be on the lookout for red, swollen gums. If you’re looking for some natural remedies for teething pain, checkout our post here. If any of the symptoms seem excessive it’s always best to follow your gut and check with your doctor. Much like the amber teething necklace, hazelwood is gaining popularity amongst caregivers looking for alternatives to medication for a variety of health concerns. 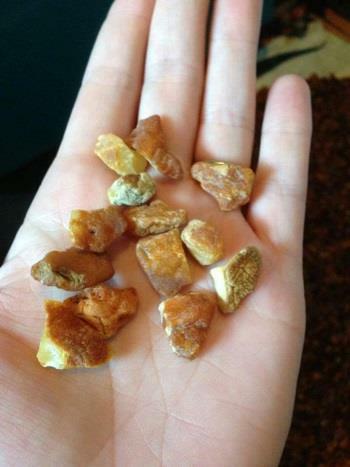 Many believe that hazelwood necklaces have the potential to improve conditions which are caused by excess acidity in the body, including eczema, colic, arthritis, migraines, constipation, heartburn, acid reflux, ulcers and even teething pain, by helping to neutralize acid in the body. In order for the hazelwood to create an alkaline environment it has to have direct contact with the skin. When the wood rests on the skin the hazelwood will naturally oxidize and reduce the overall acidity in the body over time. Since the necklaces “absorb” acidity until saturation, their lifespans vary depending on the person and their particular level of acidity. To reap the benefits of the hazelwood, it should be worn against the skin for as long as possible during the day. The more hazelwood that comes into contact with the skin, the better the potential to relieve particular health concerns. It is not recommended that babies under the age of 3 wear necklaces while unsupervised or while sleeping so to prolong wearing time you can double wrap the necklace around the ankle and keep it secure under a snug fitting sock to hold it in place next to the skin. Unlike an amber necklace, hazelwood can be kept on in the shower since water helps keep the wood moist, allowing it to be more absorbable. However, water with chlorine can alter the lifespan and efficacy of the hazelwood and should always be taken off before swimming. The best way to monitor the lifespan of your necklace is to keep an eye on your symptoms. If you begin to notice any of your symptoms returning, even slightly, you should consider a replacement. Also check the ends of the wood beads to see if the middle of the wood (not the outer bark) has started to darken, if it has, its ability to absorb acidity is diminished and its time to pick out a new one. When choosing your necklace, focus on ones with fewer stone beads and more hazelwood since its benefits are increased depending on how much is touching the skin. To determine the right size, you should be able to slip two fingers between the necklace and the baby’s neck and the necklace should never be long enough to allow baby to bring it to the mouth. Jacqueline Banks is a certified Holistic Health Counselor focused on nutrition and green living strategies. She works with women in all stages of motherhood, from mothers struggling with conception, through pregnancy, lactation and beyond to ensure the best health and nutrition for both mother and baby. Visit her blog and website at JacquelineBanks.com.